The British and U.S. Virgin Islands make excellent destinations for those seeking an island babymoon. Dramatic mountain vistas and great beaches combine with excellent shopping and fine dining, to create a wonderful babymoon getaway. Choose from the romantic seclusion of Peter Island to the bustling harbor of St. Thomas. There are great resorts throughout the Virgin Islands for your babymoon getaway. This 1,800 acre resort, located on its own private island, prides itself in immersing guests in "relaxed elegance". Enjoy the romantic seclusion of a beachfront cove or simply soak up the sun at one of five magnificent beaches. 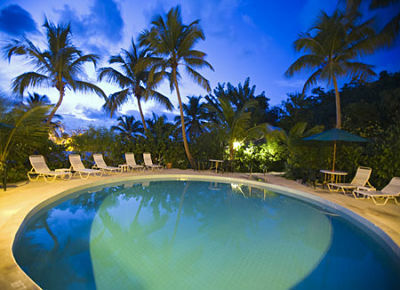 All meals and activities such as snorkeling, windsurfing, tennis and more. 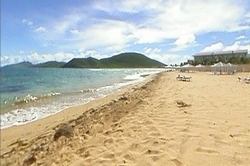 Relax and unwind at this magnificent beachfront resort on the romantic island of St. Kitt. Multiple outdoor swimming pools, white sand beaches and emerald waters all await you here. The resort offers dining in seven different restaurants along with nightly entertainment. If you're feeling lucky, be sure to visit the resort's Royal Beach Casino. Since babymoons are all about pampering, be sure to book a prenatal massage at the on-site Emerald Mist Spa. Set on a 170-acre peninsula amid the lush beauty of the Virgin Islands National Park and seven picturesque beaches, Caneel Bay Resort offers spacious, luxurious rooms for your babymoon getaway. Relax and enjoy the stunning scenery or take a narrated Safari Taxi tour of St. John to learn the history of the area. The Caneel Bay Resort's "Babymoon Bliss" package makes an excellent Virgin Islands babymoon getaway. With just six suites, the Hillcrest Guesthouse offers an intimate babymoon retreat. Its location – on a hill overlooking the Caribbean Sea and Cruz Bay – affords stunning views, with the convenience of restaurants, stores and cultural excursions just a short distance away. The suites are well equipped, with air-conditioners, TV/DVDs and either a kitchenette or full kitchen facilities, so you can prepare your meals as and when you want them. A full dining set allows you to eat in comfort and free Wi-Fi access is provided. A complimentary menu including breakfast items is placed in your suite prior to arrival. Request the babymoon package when you book, and you will also receive a pedicure coupon and fruits of your choice. 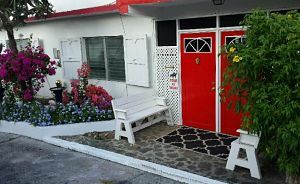 If you're looking for a Virgin Islands babymoon where you can truly relax and get away from it all in a peaceful and intimate setting, then the Garden by the Sea B&B may well be just the place for you! 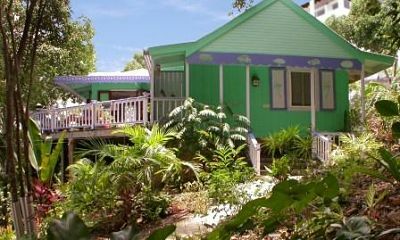 Located in the heart of Estate Contant and Enighed, just a short distance from Cruz Bay and Frank Bay Beach, this beautiful Caribbean home is brightly decorated with local art and surrounded by lush tropical vegetation. You can choose to unwind and enjoy nature, with lots of nesting birds, peacocks and iguanas in the vicinity... or you might like to take a 10 minute stroll into town, where you can take advantage of the shopping and restaurant facilities. The Garden by the Sea B&B doesn't offer a traditional babymoon package, but its range of amenities (including bath robes, beach towels and beach blanket), comfortable accomodation and stunning location make it the ideal place to take a break from the daily routine and to get lots of rest as you anticipate the arrival of your little one. The award-winning Sugar Mill is set amid stunning tropical gardens on the island of Tortola. Small, intimate and exquisitely romantic, the resort offers excellent cuisine in the perfect setting – it was actually named "one of the most romantic dining rooms in the world" by Conde Nast concierge.com. A circular freshwater swimming pool provides a relaxing spot at which to while away the hours and the resort's small beach boasts an natural reef, so the daddy-to-be can enjoy a little snorkelling whilst mommy relaxes. 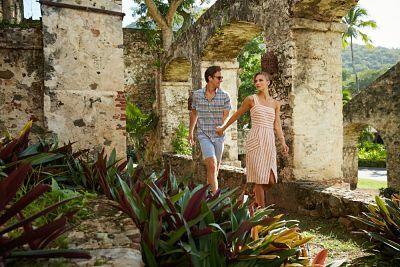 The Sugar Mill offers a range of 'extras' in addition to its bed and breakfast or 5 star all inclusive deals - there is the option to 'customize' your vacation just the way you like it, ensuring your have the babymoon break of your dreams.